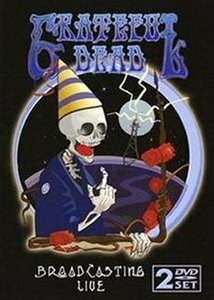 Over two and a half hours of the Grateful Dead broadcasting Live from New Years Eve 1987 into New Years Day 1988 Rock's longest, strangest trip, the Grateful Dead were the psychedelic era's most beloved musical ambassadors as well as its most enduring survivors, spreading their message of peace, love, and mind-expansion across the globe throughout the better part of three decades. The object of adoration for popular music's most fervent and celebrated fan following - the Deadheads, their numbers and devotion legendary in their own right - they were the ultimate cult band, creating a self-styled universe all their own; for the better part of their career orbiting well outside of the mainstream, the Dead became superstars solely on their own terms, tie-dyed pied pipers whose epic, free-form live shows were rites of passage for an extended family of listeners who knew no cultural boundaries. The Dead's response to the situation was to bow to the demands of fans and record their first live album, 1969's Live/Dead; highlighted by a rendition of Garcia's "Dark Star" clocking in at over 23 minutes, the LP succeeded where its studio predecessors failed in capturing the true essence of the group in all of their improvisational, psychedelicized glory. It was followed by a pair of classic 1970 studio efforts, Workingman's Dead and American Beauty; recorded in homage to the group's country and folk roots, the two albums remained the cornerstone of the Dead's live repertoire for years to follow, with its most popular songs - "Uncle John's Band," "Casey Jones," "Sugar Magnolia," and "Truckin'" among them - becoming major favorites on FM radio. Despite increasing radio airplay and respectable album sales, the Dead remained first and foremost a live act, and as their popularity grew across the world they expanded their touring schedule, taking to the road for much of each year. As more and more of their psychedelic-era contemporaries ceased to exist, the group continued attracting greater numbers of fans to their shows, many of them following the Dead across the country; dubbed "Deadheads," these fans became notorious for their adherence to tie-dyed fashions and excessive drug use, their traveling circus ultimately becoming as much the focal point of concert dates as the music itself. Shows were also extensively bootlegged, and not surprisingly the Dead closed out their Warners contract with back-to-back concert LPs - a 1971 eponymous effort and 1972's Europe '72. The latter release was the final Dead album to feature Pigpen McKernan, a heavy drinker who died of liver failure on March 8, 1973; his replacement was keyboardist Keith Godchaux, who brought with him wife Donna Jean to sing backing vocals. 1973's Wake of the Flood was the first release on the new Grateful Dead Records imprint; around the time of its follow-up, 1974's Grateful Dead From the Mars Hotel, the group took a hiatus from the road to allow its members the opportunity to pursue solo projects. After returning to the live arena with a 1976 tour, the Dead signed to Arista to release Terrapin Station, the first in a series of misguided studio efforts that culminated in 1980's Go to Heaven, widely considered the weakest record in the group's catalog - so weak, in fact, that they did not re-enter the studio for another seven years. The early '80s was a time of considerable upheaval for the Dead - the Godchauxs had been dismissed from the lineup in 1979, with Keith dying in a car crash on July 23, 1980. (His replacement was keyboardist Brent Mydland.) After a pair of 1981 live LPs, Reckoning and Dead Set, the group released no new recordings until 1987, focusing instead on their touring schedule - despite the dearth of new releases, the Dead continued selling out live dates, now playing to audiences which spanned generations. As much a cottage industry as a band, they traveled not only with an enormous road crew but also dozens of friends and family members, many of them Dead staffers complete with health insurance and other benefits.